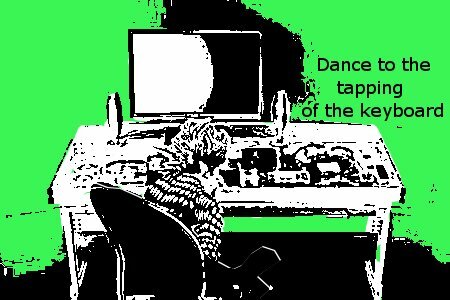 For Klepsacovic – Troll Keyboard Dancing. I couldn’t help myself – it was fun to do – I learnt to change the thresholds on different parts of the image to keep the details on the second one. 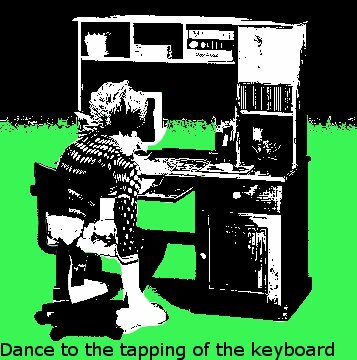 I like that one better because it’s more obviously a troll hunched over a keyboard. Dancing. 🙂 Though the 1st one looks more like a troll facerolling the keyboard. Desks nicked from Google images. – Troll Model from Model Viewer – and Image editor = Gimp and all the fun of thresholds – quick masks – a little pathing to get the trolls seated behind the chair back – and some good old fashioned paintbucketing. No trolls were broken in the preparation of these images. The first one is obviously me playing my shaman in vanilla with every key bound to frost shock.